Some meals offer value but fall short of physique-building completeness. Add a protein shake to give those yummy meals some extra nutrition. Your lunch routine of chicken, brown rice and broccoli is starting to look more like lizard guts and green shoelaces. So after some fun in the grocery store, dust off your chef's hat and try some new recipes and food combinations. For the most part, your meals and snacks are nutritional and taste good, but you can't fight the feeling that your meals might be missing something. That something is usually protein. Because protein is essential for building lean muscle, your meals need to provide you with the proper amount. Chicken doesn't go well with a bowl of oatmeal, so what do you do for protein? You mix a protein shake, that's what. The following meals have quality macro nutrition on their own, but protein supplements power them from mainstream to manna. Going out to lunch with your work crew can be dangerous if your buddies aren't as health-conscious as you are. The menu - full of breaded, fried and fatty choices - looks pretty grim. In this situation, seek out the lightest fare you can find. It might take some serious detective work, but usually you'll be able to find some sort of garden salad, Sherlock. Order it with the dressing on the side, and have the chef do away with any high-fat, high-calorie ingredients like ramen noodles, candied nuts, high-fat cheese or taco shells. Next up, pair the salad with a protein shake! Adding protein will ensure you get a high-quality protein source without any saturated fat. You already know that cereal/granola bars should be called crap-ola bars. They're loaded with refined carbohydrates and rarely contain any good protein or healthy fats. They will not help you get through your afternoon. Instead, you made yourself a batch of home-made granola. It's got a great mix of complex carbs, fiber and healthy fats. Your fantastic, original granola will contain more protein than the average cereal bar, but there's still not enough to fuel you through the afternoon. Add casein protein powder, which contains minimal fats and carbs, to control the calories of this snack and you'll feel satisfied until dinner hits. You've had a great day: work was cool for a change and your training session was intense. Now, the game is on and you crave Chinese take-out. So you order "healthy" - stir-fried veggies, rice and chicken. When you open that little white box you discover that the chef must have forgotten about the chicken component of your meal. Oh wait, there it is: - four, bite-sized pieces that look more like dried apples than actual chicken. fills the nutritional gaps that this otherwise healthy meal provides - insert protein shake here! The shake should up the meal's total protein level to 30 grams or higher, which is the amount most people should aim for. Whether you're looking to build muscle or burn fat, a bedtime meal consisting of protein and healthy fats is typically the best way to go. Protein will supply the amino acids to help rebuild and repair tired muscles, and the healthy fats will keep blood-sugar levels stabilized and prevent hunger from creeping up in the middle of the night. 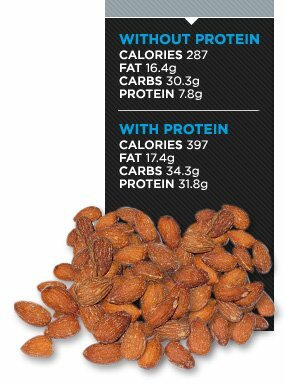 If you like having a handful of nuts before you go to bed, try pairing it with a protein shake. Or, mix 1/3 cup of water with casein powder and a tablespoon of natural peanut butter. Either choice offers muscle-building sustenance all night long. So the next time your meal doesn't quite perform the way you want, supplement it with protein for some nutritious reinforcement.